“How deep have you been underwater?” was a question asked by one of my open water course. This is a tricky question, one that I don’t like to answer because I fear that my students may aspire to my maximum depth, or worse, attempt to beat it. 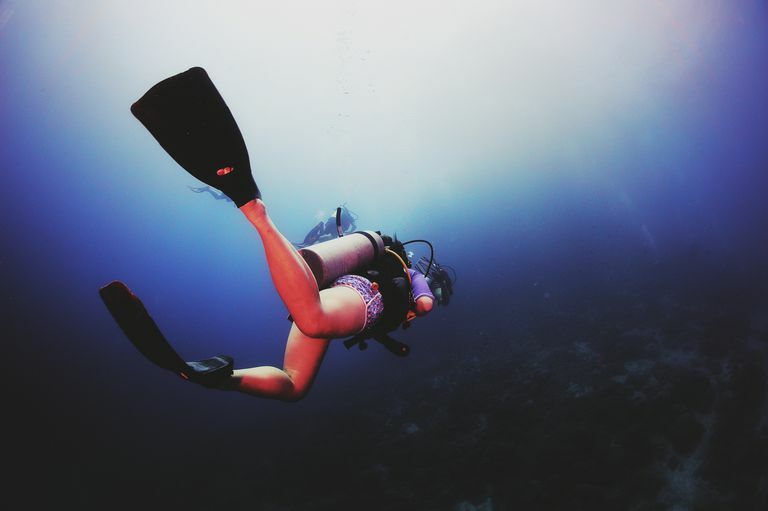 A more appropriate question is, “How deep should scuba divers descend?” Unfortunately, the answer is not straightforward–it depends on a variety of factors such as breathing gas, experience level and personal tolerance for high partial pressures of inert gasses and oxygen. What Is the Deepest a Scuba Diver Has Descended? The current depth record for open-circuit scuba diving is held by Ahmed Gabr, who descended to 332.35 meters (1,044 ft.) on September 18, 2014. More Importantly, How Deep Can You Dive? Most recreational scuba diving organizations set the maximum depth for a certified, experienced recreational divers breathing air at 130 feet. Divers should heed this guideline. The fact that extremely experienced, technical divers have descended beyond 1000 feet on admittedly risky dives does not mean that recreational divers have any business breaking suggested depth limits. When a diver considers the reasons behind established depth limits, it becomes obvious why breaking depth guidelines is foolish. The deeper a diver descends, the shorter his no-decompression limit will be. For example, a diver who descends to 40 feet can remain at the depth for 140 minutes (air supply permitting). A diver who descends to 130 feet can stay only 10 minutes at that depth before accumulating so much nitrogen in his body that he requires a series of decompression stops on the way up to reduce his risk of decompression sickness. Descending beyond 130 feet without decompression dive training does not allow a diver much time to enjoy his dive. A diver breathes air at the pressure of the water around him (ambient pressure). The deeper a diver goes, the more the air he breathes compresses (learn more about water pressure and diving). At a depth of 130 feet, a diver consumes his air approximately five times faster than he does on the surface. Divers who plan on diving to this depth will find that their dive time is limited by air consumption. Not only will a diver use his air more quickly at greater depths, he will also require a large air reserve for the long ascent from deep dives. Some gases, such a nitrogen, may cause narcosis in divers at increased partial pressures. Every diver will experience this narcosis eventually, but the onset of inert gas narcosis varies from diver to diver and from day to day. Be warned–even if you experience the drunken feeling of narcosis as enjoyable, it shares many of the symptoms of alcohol intoxication such as impairment to motor coordination, judgment, and reasoning. Some divers even report visual disturbances and a skewed sense of time. This is not a good state to be in when deep underwater. A diver should slowly increase dive depths as he gains experience and he should be sure to make his initial deep dives (deeper than 60 ft.) with a qualified individual, such as a guide or instructor who can monitor him for signs of narcosis and assist him if necessary. At very high concentrations, oxygen becomes poisonous (oxygen toxicity), causing convulsions, unconsciousness and even death. When the recreational depth guidelines are followed, oxygen toxicity is not a concern for scuba divers. Still, this gives divers another very good reason not to exceed depth limitations. The oxygen in air may become toxic at depths beginning at approximately 218 feet, and gas mixtures with high percentages of oxygen, such as enriched air nitrox, may be toxic at much shallower depths. Depth is a stress factor in scuba diving. Psychologically, deeper dives are stressful because divers are farther from their exit point. Divers will notice their air supply dropping more rapidly than at shallower depths, may notice an increase in breathing resistance and are likely to experience some form of mild narcosis. While deeper dives are frequently very beautiful, have pristine reefs, and different wildlife than shallow dives, divers should increase their dive depths cautiously. Making your first deep dives under the supervision of a qualified guide or instructor is always advisable.